Patrick Gallagher is well known in Information Technology circles. He has a vital interest in e-health, particularly in the area of shared records and e-prescriptions, also supply chain issues. He maintains a very clear vision of what ought to be, but he and many others in the IT field, are frustrated by government agencies full of experts who have never actually worked in a professional health setting. So we see ongoing wastage, astronomical spends and "top down" systems that are never going to work. Patrick needs to be listened to. It is a long and irritating story so let me give you the snapshot. Sat in the waiting room until just on midnight with about 100 other people. Got into the emergency ward and a bed at 12:20 am. Saw the first doctor at 5:00 am. That is over 9 hours. As I sat there it was hard not to ponder the hullaballoo surrounding the COAG ‘reform’ decisions between Rudd and the Premiers. Where will the ‘extra’ money, from the magic pudding trick, go to remedy this situation? Sadly my conclusion was that, as always, it will be vacuumed up by administration and probably little will be seen to hit a ward anywhere. None of this funding, I will keep emphasising, is new money. Just reshuffled existing money will be spent on making change (not) happen. No where will you see any investment in re-forming basic procedures and policies, let alone any vastly needed technology upgrades to make it all actually come to pass. If you have been following the story in the press, many informed and objective pundits have raised the bleeding obvious observation that the oldest adage is the right one; prevention is better than cure. Particularly keeping our old folk out of hospital beds. Where is the funding for that? All of this non-hospital, preventative funding, is what should be taking priority and it plainly is not. Of course you will not find that opinion amongst the nation’s finest in the press gallery, because as long as it is this party that is in power they will not make really damaging opinion waves, no matter how dire the situation. All very sad. Translation, I think, is that they are not too ill to be an emergency, so after they have the day off then they all turn up at emergency to avoid paying a GP or a clinic a $50 fee for a consultation. It seemed to me at the time that an amazingly simple answer is to also charge people who turn up at emergency the same fee as a GP would and then sort it out afterwards; whether they are wheat or chaff. Dinky-di emergency patients do not have to finally pay and all the others can kick the tin with $50. Technology holds an answer to this, and technology was barely visible to me this week. There is still paper everywhere. Files, clipboards, reams of the stuff. Hello – where is the technology link? How come the incoming hoards don’t first stop at a welcoming check point where a clerk (and there were plenty of them on show) pre-checks the necessary details online before streaming people to an appropriate clinical triage point. Hopefully this online access will identify some basic details, along with any past, non-clinical activity, and commence the updating of any new details, electronically. This process could also double up as the pre-payment point before the clinical decision is made as to whether any $50 payment will be waived or not. Any use of technology in this or any other way, can only help the clinical staff (all three of them, by the way this week, at the front line triage point) sort the mess out in some way before it overwhelms them. By the way, the triage point is way at the back of the waiting room and is a reinforced glass teller-type window. Presumably to protect the triage nurses and doctors from ‘attack’ or harm. Which in itself screams ‘wrong’? How can it be that people who are there to help, feel threatened by those that presumably come to be helped? Whatever the reasons it is the most inefficient method of serving the ‘client/patient’ that one could ever imagine. Silly me. We do have tens of thousands of bureaucrats with not much more to do than sit back and imagine things; it is obvious none of them actually do much of anything useful. Now that I have that off my chest I guess I should mention a bit more on the technology front seeing that’s what our sainted editor asks me to write about. Now that the Department of Sickness and Death, aka the Department of Health and Ageing, will now have a 60% say in running things, perhaps they will grasp that their past rhetoric about e-health is actually true and now they should ‘do something’ to make ‘it’ happen. So, let turn out attention to what they are actually supposing to be doing now, as announced by our supreme spinning top bureaucrat, err, the PM. That is, implementing Activity Based Costing, aka Casemix. Perhaps on one good day in 100 that might be possible in Victoria. As for the other States and notably the Puppet State, never in the proverbial 100 years will it happen the way things are now. Let me tell you the zillion reason why. Technology is the catch all answer. ICT systems that business use to manage inputs, outputs and outcomes. Otherwise referred to as accounting disciplines that produce Balance Sheets, P and L accounts and general financial controls. In our hospitals there is precious little in the way of any semblance of timely, accurate and useful data and IM on basic cost measurements. How in hell can the politicians and the far away bureaucrats possibly ‘administer’ a sharing out of funding allocations based on true ‘Activity Based Costing’ when no bugger has any idea of actual costs? Yet very few pundits have picked up on this F.A.C.T. The ICT technology needed to manage the actual costs of delivering goods, services and infrastructure is NOT in place. I have often used the comparison to that of running a hotel and more realistically a private hospital. Both do have true costings which we have previously made mention of in comparing the mini-bar bill to a discharge summary. Well, as much as one’s wild imagination can stretch the comparison to anything remotely meaningful. My prediction that this Health Funding Reform will all end badly. Think of any analogy to pink bats, BER, ETS and whatever else takes your fancy and this will turn out the same, or worse. Worse, because this is about controlling, if not trying to hide, the cost details of sickness and death and not about prevention and focused care. We can keep going back to comparing what a private hospital uses to manage and report on relative costs and incomes as a benchmark for our woefully managed public sector sites. Why should that remain the case? How can it remain the case? So, here we have a Health Reform Policy, no extra sarcasm intended, with no attention to the boring, tedious and mandatory matter of the means of achieving any actual measurement of activity costing. Just a vote creating machine of the lowest type. Above I mentioned all the paper on display in the emergency department. Any visit to any ward will re-affirm that paper rules in our present hospital, circa 1980s, administration system. 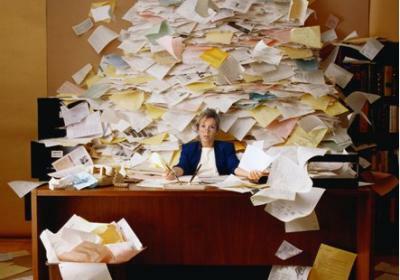 So, the crudest of all observations is how do we get rid of, or minimise the use and reliance on paper. How will that happen? Will we get it with this malarkey called funding reform? See? I know this is all going to end badly, very badly indeed. Sigh. Next month I hope to be able to give you some news on the e-script front; standards and all that good stuff. Previous story: A once in every five years opportunity that must be taken.